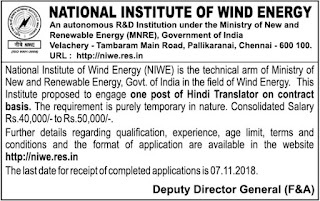 NIWE Chennai Hindi Translator Recruitment 2018 2019 | NIWE Chennai invites Application for the post of 01 Hindi Translator Posts. Aspirants Download Application Form through Official website www.niwe.res.in | Opening Date and time for Submission of Application is 30.09.2018 and end up by 07.11.2018. You can check here NIWE Chennai Recruitment Eligibility Criteria, Pay Scale, Application Fee/Exam Fee, NIWE Chennai Selection Process, How to Apply, NIWE Chennai Syllabus, NIWE Chennai Question Paper, NIWE Chennai Admit Date Release Date, NIWE Chennai Exam Date, NIWE Chennai Result Release Date & other rules are given below.. Aspirants are requested to go through the latest NIWE Chennai job recruitment 2018 fully, before applying to this job. As per the recent NIWE Chennai notification 2018, the eligibility details like Educational Qualification & Age Limit for the Hindi Translator job has given below. Master's Degree of a recognised university in Hindi / English with English/Hindi as a main subject at the degree level. Master's Degree of a recognised university in any subject with Hindi as a medium of instruction and examination with English as a compulsory subject at degree level. Bachelor's Degree with Hindi and English as main subject or either of the two as medium of examination and the other as a main subject. Recognised Diploma/ Certificate course in translation from Hindi to English and vice versa, two years experience of translation work from Hindi to English and vice versa in Central or State Government Offices including GOI undertakings. Should know Hindi and English Typing, and Computer MS Office. a) Not exceeding 28 years; age relaxation for SC/ST/OBC/ PWD / Ex- servicemen shall be as per rules. b) Not exceeding 64 years in case of retired Government Servants from Central Government/ Autonomous bodies/PSUs. Rs. 40,000/- to 50,000/- p.m consolidated, subject to deduction of Tax as per rules. NIWE Chennai may follow the following process to select the candidates. 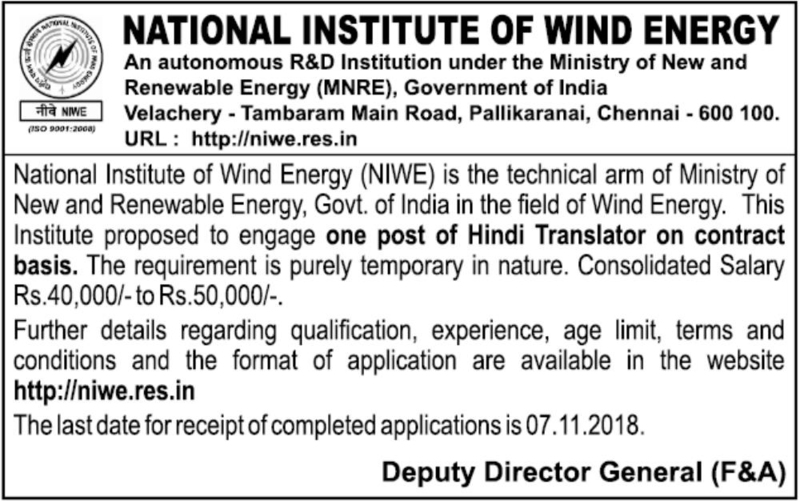 How to apply NIWE Chennai Hindi Translator Vacancy?